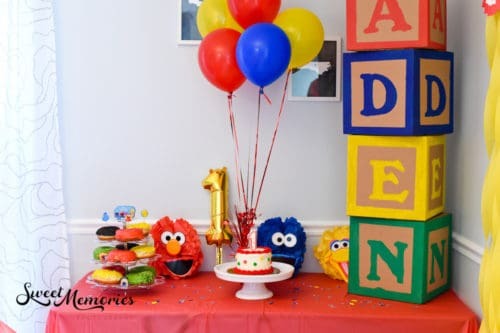 Elmo Themed Boca Birthday Party | Happy 1st Birthday Aden! 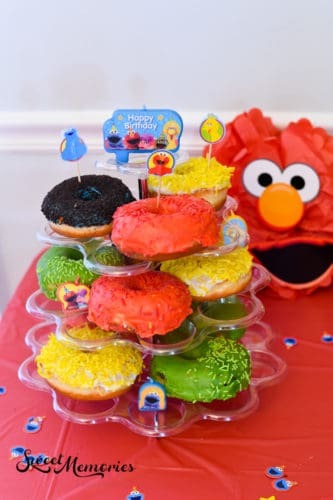 This Elmo themed Boca birthday party post was written by my sister and Modern Boca Mom contributor, Lauren Ricks. I am so happy she decided to share my nephew’s birthday party details with all of us! Enjoy! By the way, this post also contains affiliate links. If you decide to purchase party items through these links, Modern Boca Mom will get a little kickback. Thank you for supporting this blog! When everyone told me that time would fly when you have your first child, they weren’t kidding! I blinked (and shed some tears!) and it was here: MY SON’S FIRST BIRTHDAY! Of course I wanted it to be perfect, but I’m a full time stay-at-home mom. This isn’t the time for my family to break the bank. 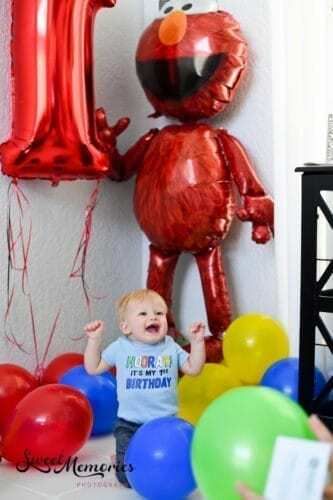 My son, Aden, made picking the party theme pretty easy because he LOVES Elmo and Sesame Street. 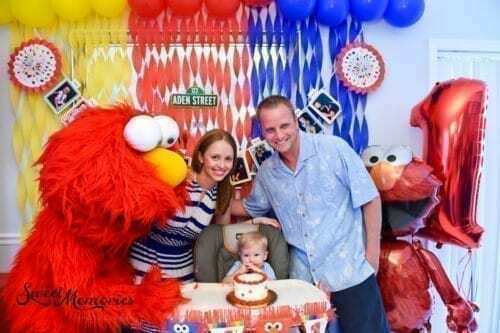 It was an Elmo themed Boca birthday party for the win! 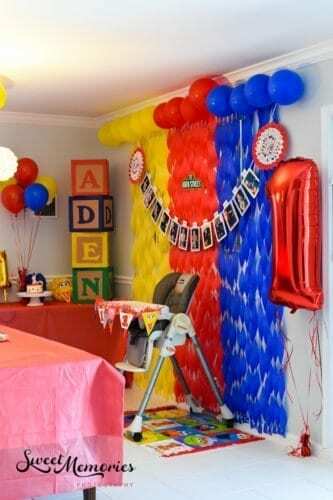 Aden is also obsessed with balloons making those decorations a must for his 1st birthday celebration. 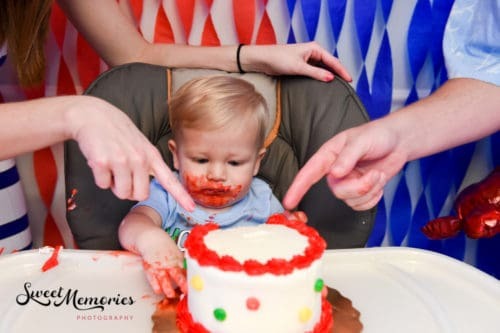 I decided it would be fun to focus on primary colors for the party and found a lot of inspiration from Pinterest. It helped a lot when trying to come up with affordable ideas that would be fun for both kids and adults! 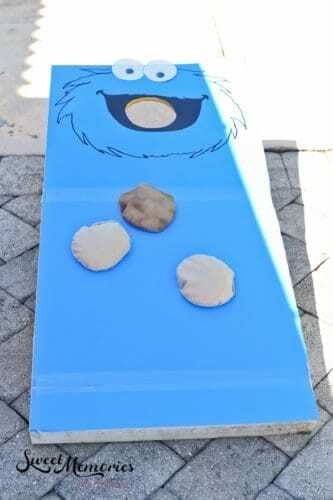 Can you say Cookie Monster corn-hole?! Most of our Elmo themed Boca birthday party was outside. We got lucky with beautiful weather on March 3rd! It was windy, but I was able to learn (the hard way) how to secure my centerpieces from Aden’s baptism celebration earlier this year (spoiler alert: sand). A lot of the party decor came from Dollar Tree and Amazon and just using creative ideas. This allowed me to keep costs down and still achieve a fun look. 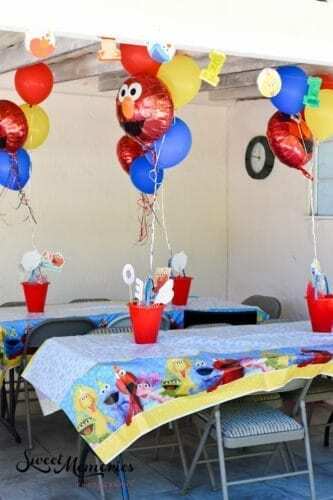 Purchase our Elmo themed Boca birthday party tablecloths and plates by clicking HERE! Purchase Sesame Street Party Hanging Honeycomb Decor by clicking HERE! Like I said before, my son loves balloons (all of the Elmo balloons came from this awesome store Dollar Deals Plus in West Palm Beach). I tried to incorporate those in almost everything. We even had a life-sized Elmo balloon that walked! I made this fun backdrop for his cake smash using only streamers and balloons. Etsy helped me create the cute “Aden Street” sign. All I had to do was print it and hang it up! The huge blocks were a Pinterest find. I decided to simply purchase plain boxes and paint them. Who doesn’t love a trip down memory lane?! 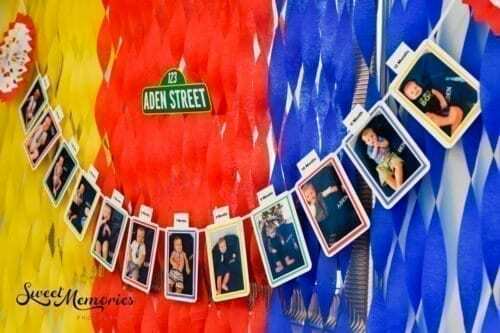 The baby photo banner was so easy to make using colored paper and cardboard. I printed out each month’s photo, punched holes for the ribbon and viola! When it came to the food, I wanted to keep it simple. Since the party was at noon, lunch items were an easy choice. There’s nothing better (or easier) than Chick-Fil-A nuggets, Publix wraps and subs, pasta and fruit salad! For dessert, of course we wanted to have Aden smash his cake and boy did he! Publix made this cute little cake for him. For the rest of our guests, I wanted to mix things up a little, so I ordered these custom donuts from Nani’s Hand Crafted Doughnuts in Delray! They were delicious and so delightful to work with! 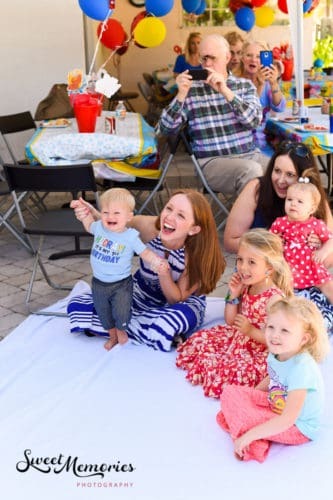 We rounded out the party with a few more fun activities including a ball pit, water table, bubbles and…cue Aden’s reaction to seeing him for the first time-you guessed it ELMO (Risa Teate)! This smile made the whole party worth it! Elmo was amazing and really interacted with the kids by singing, dancing, reading stories and playing pin the nose on Elmo! Elmo Live is a fabulous company to work with and we highly recommend Risa! 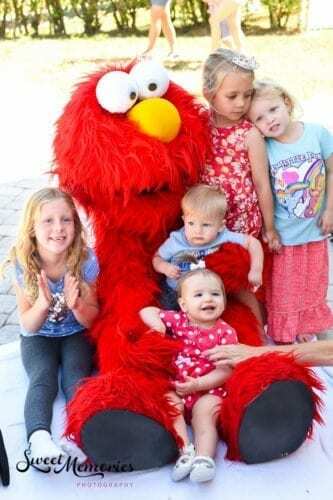 To book Elmo for your next event, call 561-502-2609. 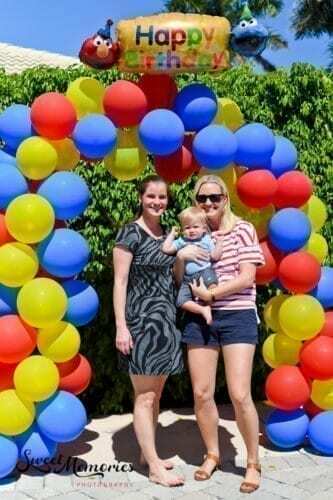 I decided last minute to create a balloon arch and my sister in law came to the rescue putting it all together the morning of the party. It was a great place for a photo op! 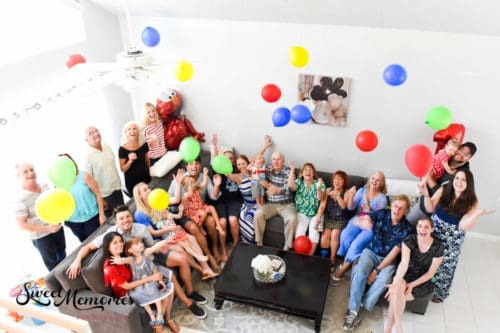 And speaking of photos…all of these beautiful shots were taken by our family photographer Naomi of Sweet Memories Photography. They are priceless! P.S. This post is not an advertisement. 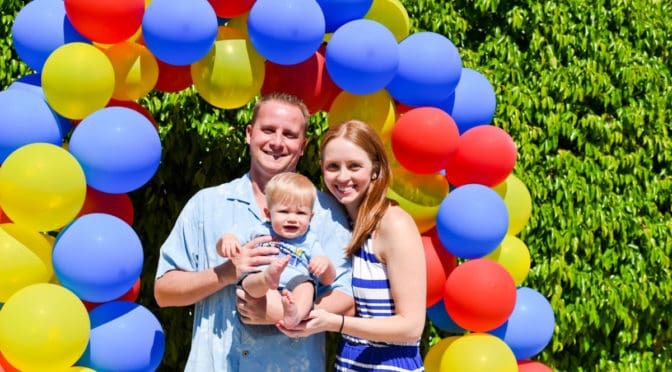 However, I highly recommend all of the vendors used for making Aden’s 1st birthday party a HUGE success!